Good nutrition and a balanced diet are essential for your pet’s health. People often ask me what they should feed their dogs. Over the years, I have made some observations on the health of dogs fed an enormous variety of diets. It’s amazing how well they do on such varied entrees. Here are some of my conclusions. What and when you feed your dog early in life will shape its preferences when it is older. This applies to time of day, odor, texture, taste and meal temperature. Up to fifty percent of an adult dogs diet can come from carbohydrates such as grain. Water should be available to your pet at all times – especially during heavy exercise to prevent dehydration and overheating. Adult dogs do well on just one or two feedings a day but puppies need to eat more frequently. Commercial dog foods are available in three forms: canned dry and semi moist. I do not recommend semi-moist dog food be cause of the large amounts of additives in it. More dry food is sold than any other type. Dry foods contain about 90% dry matter and 10% water. They are a blended mixture of grains, meat and meat by-products, fats, mineral and vitamins. Canned dog food contains 68-78% water and 22-32% dry matter. Given their choice, most dogs prefer canned diets. The aroma, flavor and palatability of dry diets do not match that of canned. Which ever you buy, be sure the label says that the diet meets the National Research Council’s guidelines on canine nutrition and is certified by the Association of American Feed Control Officials. Over the years I have found that dogs fed dry diets have less tartar build up on their teeth and less gum disease surrounding the teeth. They also have less obesity problems. With time, gum inflammation associated with canned diets causes the tissues surrounding the teeth to recede and the teeth to loosen. Also with time, bacteria moving through the blood stream from infected gums cause damage to the kidneys and liver. Dry dog foods have greater caloric density – that is they are richer. This is because canned food contains about 75% water. I never see nutritional diseases in dogs fed commercial canned or dry dog foods. I do, however see them in dogs fed primarily table scraps. Feeding unsupplemented hamburger and rice mixture or table foods can induce a calcium deficiency and secondary over activity of the parathyroid glands located in the neck region (hyperparathyroidism). Also, all-meat diets can lead to constipation problems. Feeding a Liver-based diet can induce vitamin A toxicity. Many homemade diets contain excess protein and phosphorus but are deficient in calories, calcium, vitamins, microminerals and fiber that your pet needs. There are ten essential amino acids, the building blocks of protein, that dogs cannot manufacture on their own. Studies have shown that dogs can tell when their food lacks a single amino acid and will avoid such a meal. One amino acid, taurine, is sometimes deficient in dry dog chows. Although dogs can synthesize taurine from cysteine or methionine diets composed chiefly of lamb and rice seem to prevent this process. This may be due to the action of rice bran in increasing the body’s loss of taurine through the intestine. Dogs lacking taurine are susceptible to a form of heart enlargement called dilated cardiomyopathy or DCM. Although high fiber diets are not natural for dogs, some dietary fiber is important for gastrointestinal motility. Diets rich in dietary fiber can also aid in weight loss. Too much fiber can prevent the absorption of vitamins and minerals and lead to diarrhea. There are twelve minerals that are essential for dogs. One of these, calcium, is essential for the formation of bone and teeth and as a signal chemical between nerve cells. Puppies that do not receive sufficient calcium have pinkish, translucent teeth a bow-legged stance and knobby painful joints. Partial bone fractures in these puppies are common. Most of these puppies were the offspring of nutritionally deprived mothers. Others received a diet that was primarily meat and bread. Meat is low in calcium and high in phosphorus. High phosphorus interferes with the absorption of the little calcium that meat contains. Older dogs on low calcium high phosphorus diets also suffer from tooth and bone problems. A lack of vitamin D3 can also contribute to this. Magnesium is important for muscle and nerve cell activity as well as a portion of the mineral structure of bone and teeth. Dogs deficient in magnesium have reduced weight gain, as well as motility problems later in life. Dogs are remarkably adaptable to a wide range of ingredients, texture, and form in terms of what they will eat. Though many dogs prefer animal-based protein, they can thrive on a supplemented vegetarian diet. Regardless of whether the protein comes from plant or animal sources, normal adult dogs should get about 10 percent of their total calories from protein. Older dogs appear to require as much as fifty percent more protein to maintain their protein reserves. Dogs eat larger, less frequent meals than cats do. It is OK to feed your adult dog once or twice a day. Puppies, however, need more frequent feedings. Most owners allow their pets to eat as much as they desire. This is fine unless the dog gains excessive weight. Dog foods differ primarily in their source of protein. Generic dog foods use less expensive sources of protein. Because of this, the quality of protein in generic and house brand foods is poorer. Do not be led astray by considering only the percent protein. Percent protein tells nothing about the quality and digestibility of the product. Excluding premium, niche and specialty brands sold through pet shops, the quality of dog foods is reflected directly in the price you pay. Fiber in the diet is good for overall gastrointestinal health and may help some dogs keep their weight down. The diet of normal adult dogs should contain between 2.5 and 4.5 percent fiber. However, the fiber content of some "diet" dog foods is between nine and 10 percent. 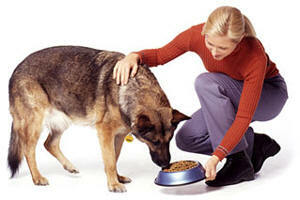 This may allow the dog to feel full without consuming too many calories for effective weight control. Diets high in fiber also may help in the management of blood sugar (hyperglycemia) and the prevention of such disorders as intestinal diverticulosis and diabetes. Too much fiber in the diet can interfere with the digestion of other important nutrients in the food and result in loose stools, frequent defecation, and reduced palatability of the dog food. Generally, foods low in starch content, such as wheat and oat bran and barley products, are high in fiber. Conversely, dog food ingredients high in starch, including rice and dried potatoes, and corn have less fiber. The simplest way to reduce overweight dogs is to feed smaller amounts on the same feeding schedule. Some dog owners offer less tasty food or allow less time to eat. Others feed several meals of bulky vegetables such as cooked carrots or cabbage to their pets. Another option is to feed one of the many low-calorie dog foods on the market. It's also important to remember to keep your dog from sampling another pet’s food and to refrain from feeding table foods as treats. Normal active adult dogs that weigh about thirty-five pounds need to eat about 1000 kilocalories a day. In most dog foods, these calories are furnished in the form of cereals, legumes and other plant products. Sick or injured dogs can require double this amount of calories. Young puppies need about twice as many calories per pound of body weight as adult dogs of the same breed. The best time to begin feeding a puppy dog food is at four weeks of age. Mother dogs that are producing milk need as much as four times the calories of non-nursing dogs. Older and lazy dogs will do fine on twenty percent less calories. Vitamins are organic compounds that take part in a wide range of metabolic activities. Dogs require vitamins in their food at low concentrations. First noticed in dogs some 75 years ago, vitamin deficiencies can lead to widely ranging clinical abnormalities that reflect the diversity of their metabolic roles. Some vitamins, like vitamin A, are not only essential in small doses, but also toxic in excess amounts. Vitamin A is important for good vision, and skin and mucous membrane structure. A lack of sufficient vitamin A in the dog’s diet leads to eye and skin problems and increased susceptibility to infection. Vitamin D3 is also required for strong bones and teeth. Inadequate amounts of Vitamin D3 will rickets if the dog is still growing. In adult dogs it causes osteoporosis. Many human vitamin preparations contain vitamin D2 which does not appear to help dogs.Vitamin E protects the body against damage due to oxidation and free radials. Besides long term aging effects, lack of vitamin E results in poor coat condition. "Dear Dr. Hines, I love your website and the information you supply me with. However, the article about what to feed a dog started with an inaccurate fact. Wolves are not strict carnivors. They are mostly meat eaters, but are oppurtunistic as well, eating berries, grasshoppers, and plants, mostly when game is scarce. Wolves actually need thses carbohydrates to stay healthy. Many zoos learned this the hard way when their wolves became weak with vitamin deficiancies. More research showed that though meat is the primary diet, the Canin Lupus also eats veggies." Hi Mate, I chanced upon your website and a very good one it is.One small observation regarding the feeding of dogs; I have had many dogs and frankly I cannot go past bones. I have no idea what happens over your way, but here we have "butcher shops" and the butcher always sells bones. Dogs thrive on them, however they also need a diet of leftovers - rice/potatoes/vegetables to keep them tip top.It's just a little feedback. Canned food is HORRIBLE (it makes them fart) and dry food, well sorry, its just not on. My shepherd is a cracker and he lives off exactly that - bones and leftovers; great teeth and coat. Happy chappy! all the best.